This month has gone by WAY to fast. I love October it’s my favorite month of the year. It’s my birthday Month and I just love everything about Octobers and am so sad it’s over. I do have some fun favorites this month. 1. It Cosmetic Complexion Perfection Dual Brush– I have had this for a long time, but recently started using it again. I use it for contouring and it’s perfect. The smaller end I use to do a defined contour and then I use the other end it blend it all out. 2. Peter Thomas Roth Firm Peeling Gel– This makes your skin feel so smooth and soft. A really great option for an exfoliant. 3. Maybelline Lust For Blush Lipstick- I have been wearing this almost every day this month. I love the color it’s a perfect dusty pink color. Perfect for fall. It’s matte, but the formula is so rich and creamy that is comfortable to wear. You can see me wearing it here. 4. 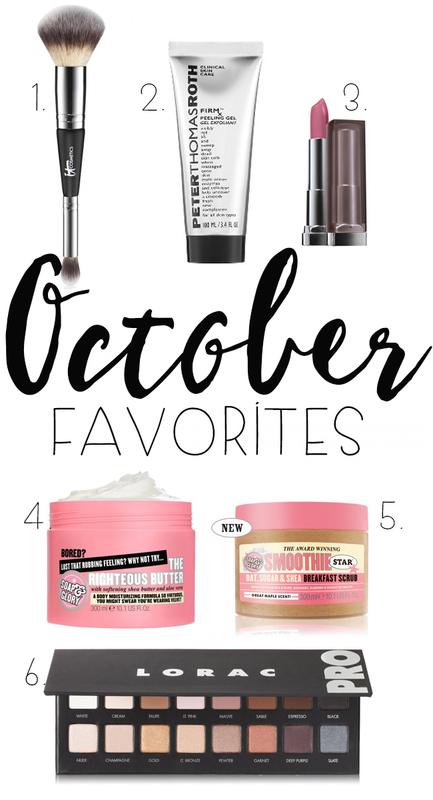 Soap and Glory The Righteous Butter– I am a HUGE fan of Soap and Glory products. I love all the body butters. They are actually the only ones that I do like. I don’t like to feel too greasy when I have them on my skin and these are not too greasy but very moisturizing. The smell is yummy too. 5. Soap and Glory Smoothie Body Scrub– This followed up by the body butter… Your body will thank you. 6. Lorac Pro Palette– I recently started to use this again and I don’t know why I ever stopped. I love these shadows. They ar rich in pigment and blend like a dream. Add this to your Christmas list. What were some of your favorite things this past month? These are all great items. I ADORE the It Cosmetic Complexion Perfection Dual Brush. What a cool tool. I may need to grab one of these! Ooooh great list! That Lorac palette is so popular and after playing with it, I see why! That lipstick, SWOON! It looks amazing! That IT Cosmetics Brush is one of my faves. I have 5 of them. yes, I said 5. LOL I would totally buy more, too! I love Peter Thomas Roth. I use the eye cream and swear by it! I love Soap and Glory! Their body butter is my absolute favorite.